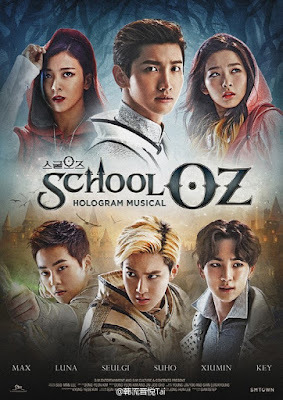 The OST for SM Entertainment′s hologram musical, School Oz, will be available online on January 20 at 12:00 p.m. KST, and the album will be released on January 21. The hologram musical School Oz is a fantasy adventure piece centered on the search for Dorothy, who disappears the day before the competition to select the ′Great Knight,′ who is the only one that can break the spell of the magical school ′School Oz.′ The musical stars TVXQ′s Max Changmin, SHINee′s Key, f(x)′s Luna, EXO′s Su Ho and Xiumin, Red Velvet′s Seul Gi and more. The School Oz OST consists of a total of 18 tracks, enabling listeners to re-experience the musical′s fun and excitement through the colorful mixture of music and dialogue. As School Oz is centered on SM artists′ hit songs, popular SM songs like BoA′s Atlantis Princess, TVXQ′s Mirotic, Super Junior′s Mr. Simple, SNSD′s Genie, Taetiseo′s Twinkle, SHINee′s Sherlock, f(x)′s Pretty Girl, EXO′s MAMA and more have been reborn as musical numbers. Popular composers like Yoo Young Jin, Yoo Han Jin, and Kenzie have created new arrangements of the pop songs for the musical, while the actors and actresses have recorded the songs in a whole new way, presenting another unique charm to the tracks. The OST album also contains addtional tracks composed by Yoo Young Jin and written by Cho Jin Joo, such as One Day One Chance, an electronic pop dance song co-produced by Yoo Young Jin and American composer team Design Music, One Fine Day, a pop dance song that introduces the wonderful magic world of School Oz and Prologue, an instrumental that captures the origin of the magical school and the musical′s philosophy, adding more fun for music fans. Meanwhile, the hologram musical School Oz is now showing a special edition at the SMTOWN Theatre in SM Town @ Coexartium in Samsung-dong′s Multi Cultural Space.